When it is time to reinstall Flight Simulator X, we all want to get the job done as soon as possible. Hold on to your horses! If you do not do it the right way, then the Flight Simulator X files will not update correctly giving you all kinds of display problems! Installing Flight Simulator X is easy. We strongly recommend that you DO NOT install Flight Simulator X into its default location of Program Files. The reason being is that from Windows Vista upwards, Microsoft has become dead set on protecting us from ourselves! Access to the Program Files directory is forbidden for us mere mortals! Even system administrators have difficulty removing files from the Program Files directory. Adding aircraft and scenery later will be mission on its own, so spare you some hair pulling later and do it right the first time around! If you just click next, next, next when installing, Flight Simulator X will be installed into the Program Files directory. If you however read what is on the screens you will see a button labelled MORE OPTIONS on the screen. Clicking on this button will give you more options such as changing the installation path. Click the BROWSE button to bring up the browse screen. 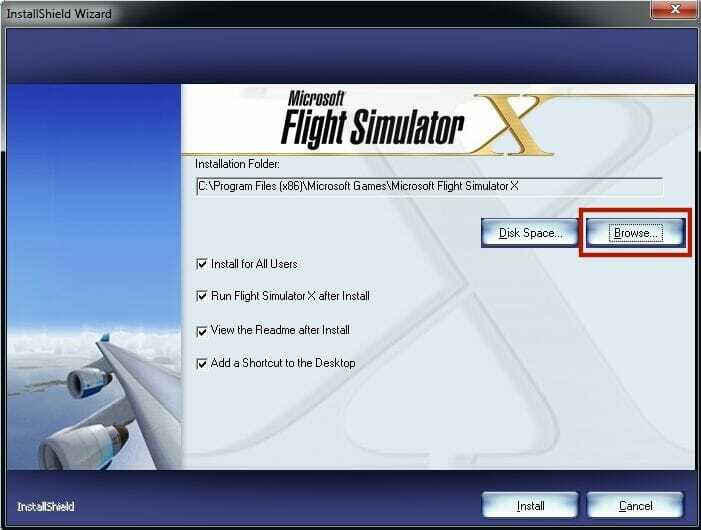 We recommend that you create a directory called FLTSIM on your main drive and then install Flight Simulator X in there. This path will not be protected by the UAC (User Access Control) feature of Windows and you will be able to easily add aircraft and scenery later without having to re-assure Windows that you do in fact know what you are doing! Now for Chinese Trick Four Thousand and Seventy Nine! Once Flight Simulator X is installed, RUN IT! Most people skip this step and directly install the service packs afterwards. This leads to all kinds of funny display problems such as disappearing aircraft and aircraft without wings. Why? Because Flight Simulator X is distributed in a compressed state. After the program is installed, it needs to be executed (run) in order for the files to unpack. The service packs can only update Flight Simulator X if the files are unpacked. If the files are not unpacked, the update will not run all the way through as it should, that simple. 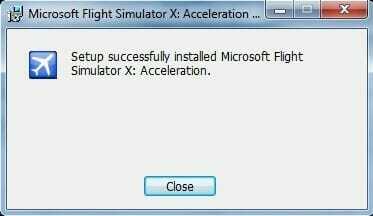 So remember: RUN FLIGHT SIMULATOR X IN BETWEEN EVERY INSTALL! 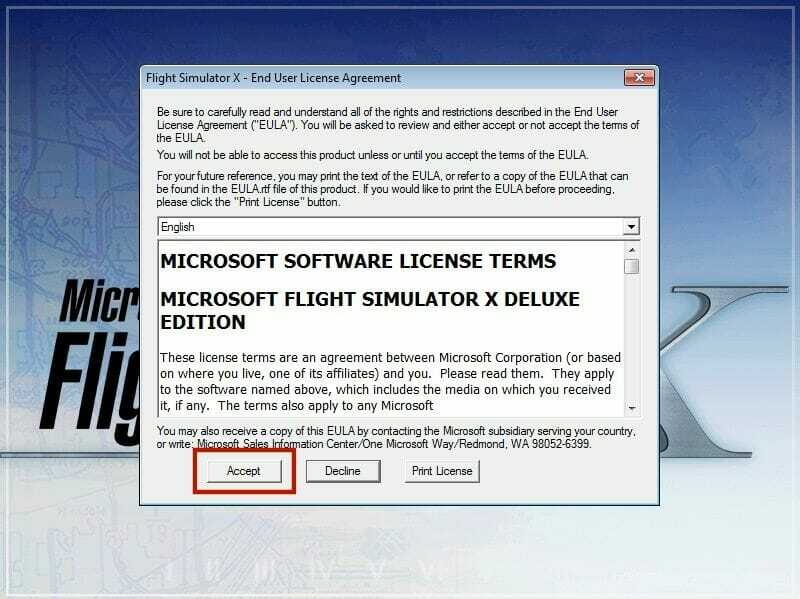 Once you run Flight Simulator X, you will need to accept the End User License Agreement before you will be allowed to continue. You will be required to activate Flight Simulator X at this stage. 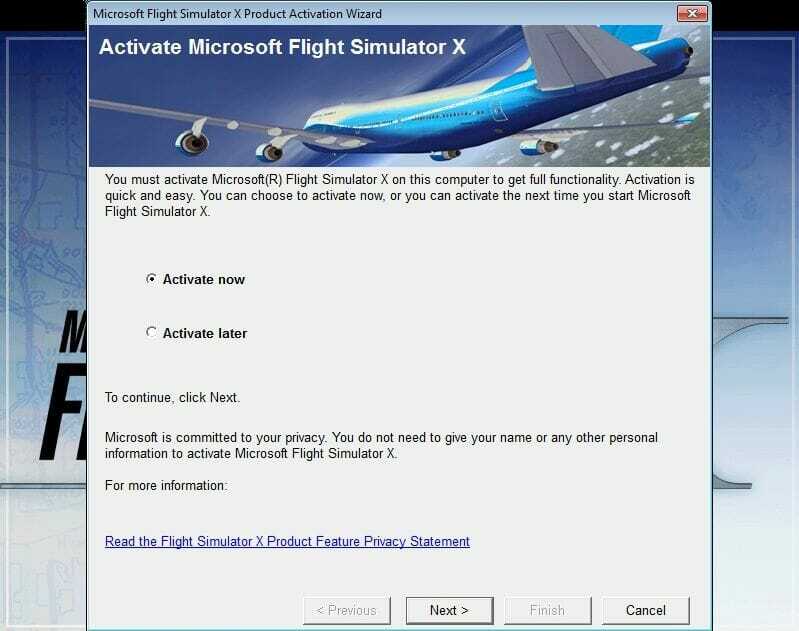 The Service Packs or the Acceleration Pack may not install if Flight Simulator X is not activated. If you have Flight Simulator X GOLD or if you have Flight Simulator X Acceleration Pack, then you can skip the following step. Install the Flight Simulator X Service Pack One and Service Pack Two. 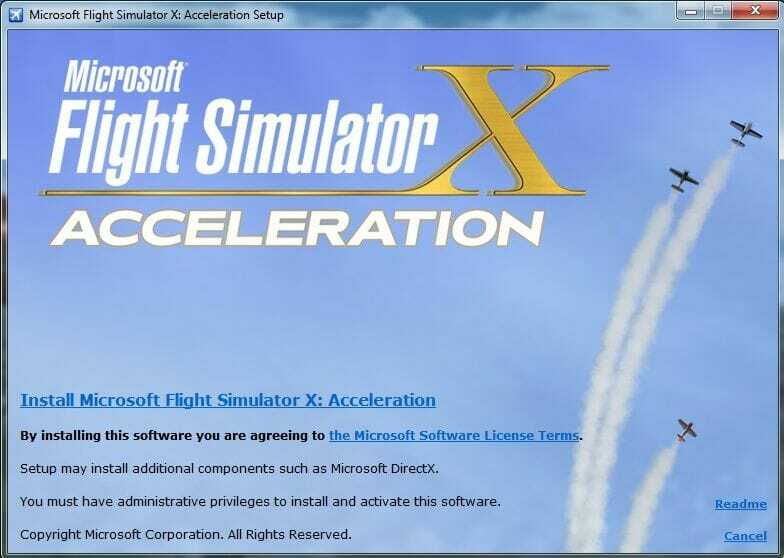 REMEMBER to run Flight Simulator X in between every install of the Service Packs. This is VERY important as for reasons mentioned before. You can skip the next section since you do not have Flight Simulator X Gold or Flight Simulator X Acceleration Pack. If you have Flight Simulator X Gold or you have the Flight Simulator X Acceleration Pack, you will have the Flight Simulator X Acceleration DVD in your hands now. Some people say that you should at least install Service Pack One before continuing. We have never done that and never had any issues. 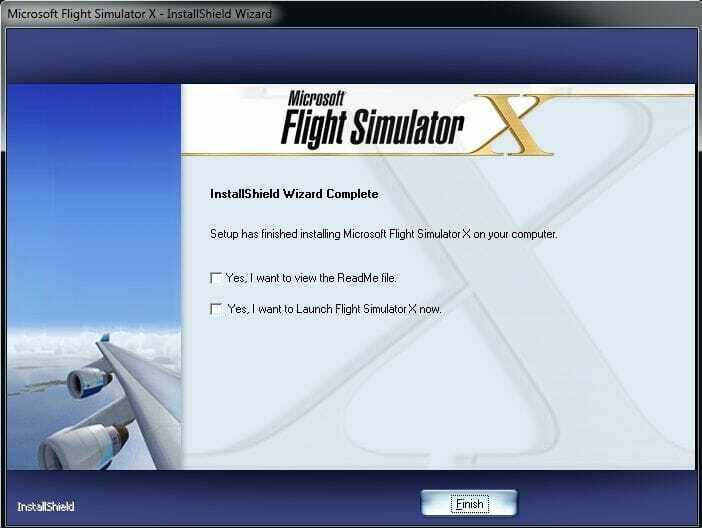 If it makes you feel safer, then you may install Service Pack one and run Flight Simulator X before continuing. This is the first screen you will see when the setup for the Acceleration Pack begins. The installation is very straight forward. 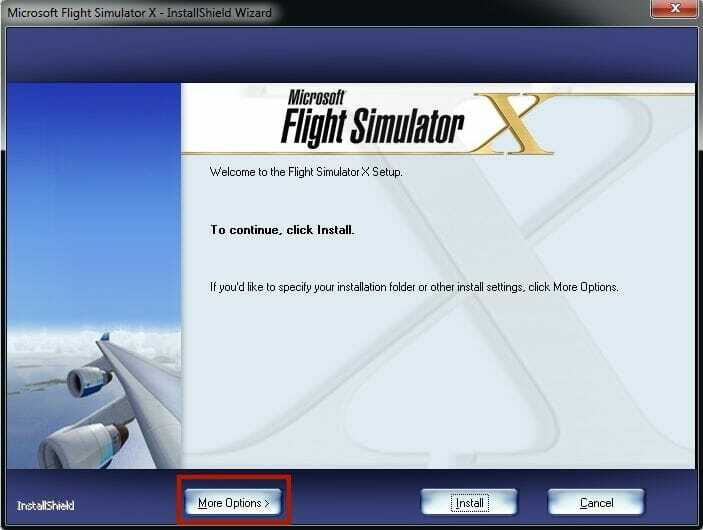 The installer will read where Flight Simulator X is installed on your system and then continue from there with very little intervention from you. Once the installation completes you will see the above screen. Now run Flight Simulator X for the final time. Make sure that everything is working. You may now also setup Flight Simulator X the way you like it. That is all there is to it! Have fun!